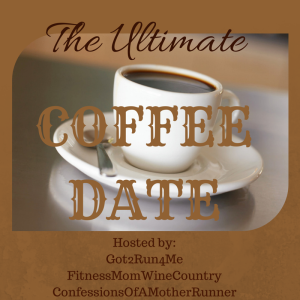 It's time for another Ultimate Coffee Date! Whoo hoo!! So, grab a cup of coffee (or tea) and join me! I don't really have a lot to share today, so this will probably be kind of a quick date. If we were having coffee today... I'd tell you how bored I am with our coffee cups. There are just 4 of them. All the same solid green. It kinda makes me sad, and I want to get some more to add some variety. I'd ask you to tell me about your favorite coffee mug. If we were having coffee today... I'd tell you how I got up super early this morning to not only pickup our Bountiful Baskets, but to volunteer with the set-up. It felt great to volunteer, and I'm super glad that I did it, but I'm not going to lie, I'm probably going to go back to bed right after this. Yawn! I'd ask what you like to do to volunteer. If we were having coffee today... I'd tell you that I didn't ride my bike to work even once this week. I have a goal of riding at least 4x this month, which would have been once a week, but now I'm going to have to do some doubling up. Hopefully I get in one bike commute next week. I'd hate for the last week of February to roll around with still 4 rides to go. Hope I didn't just jinx that! Speaking of time slipping away, I have a feel that February is going to both drag and fly! It already seems like it's flying, but at the same time, it also feels like it should be much later in the month than it is. Weird! If we were having coffee today... I'd tell you how much fun I had having a drink with a co-worker after work last night. We each only had one drink, but we talked for hours. It was so fun and SO needed! Work has been a little crazy lately, and it was fun to gossip a little a lot. That's all I've got today! Why not head on over to the Ultimate Coffee Dates hosts (Deb, Coco, and Lynda) to catch up with everyone else, too! Well I may need to upgrade to the video coffee date too! Yes you definitely need some more exciting mugs :). Thanks for linking up with us for the coffee date they are always so much fun to write and read. Maybe I'll get a new and exciting mug for next month! I like to collect coffee mugs from the different places I visit :) then it is like a memory reminder when I drink from that cup! Happy Sunday!